1. Angela Thirkell, High Rising (Virago Modern Classics edition) — Over the past few years, I’ve become enamored with a certain genre of literature…I guess you’d call it women’s fiction from the first half of the 20th century? The types of books that Persephone, Bloomsbury, and Virago are publishing, in other words. I’ve heard good things about Thirkell, so I’m itching to try her Barsetshire books! 3. Julianna Deering, Rules of Murder — The rules of murder are a real thing! When the Detection Club was formed in 1930 (members included Agatha Christie, Dorothy L. Sayers, Anthony Berkeley, and many others), one of the members set forth 10 “rules” of how detective novels should be written. Deering’s novel, I am led to believe, breaks them all. 4. Ismail Kadare, Broken April — I’ve been making an effort lately to be more global in my reading, instead of just devouring novels set in England and the U.S. Something or other led me to this article, which led me to Broken April. I’ve never read anything set in Albania before, and I’m very curious! 7. Rachel Bach, Fortune’s Pawn — Space opera and romance by the author of the Eli Monpress series? I want to go to there! Sadly, my library doesn’t have any copies, so it looks like I’ll just “have” to obtain my own. 8. Joyce Dennys, Henrietta’s War: News from the Home Front 1939-1942 — See #1 above. Woman writer + WWII = my kind of book! 9. Maurice Dekobra, The Madonna of the Sleeping Cars — Apparently this is a classic mystery novel referenced by many contemporary mystery/thriller writers. For example, Alan Furst’s train passengers are frequently seen reading it. What makes it so seminal? I want to find out! 10. D.E. Stevenson, The Two Mrs. Abbotts — If Santa can get to every house in the world on Christmas Eve, surely he can bring me a book 2 weeks before its official release date! I hope you got Eleanor & Park and the other books on your wish list! That P&P cover might possibly be the best thing I have ever seen. 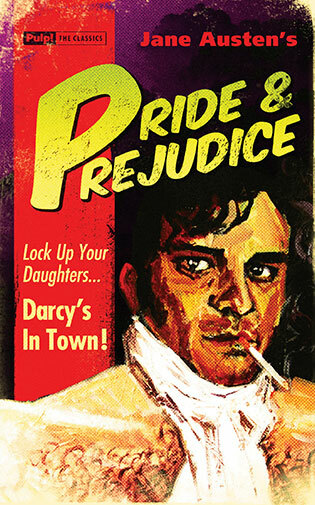 That cover of Pride & Prejudice is SO amazing. I’ve yet to read it, but I think that cover would bump it up to #1 on my TBR 😉 Merry Christmas! yay!! i’m making it a priority to read at least one Jane Austen novel in 2014 because i never have and like…obviously i should, haha! Great choices! Especially that pulp P&P! I haven’t seen it, but I think it’s love. It IS love. I must have it immediately! I haven’t seen that Pulp P&P before either- it’s sensational. I hope Santa brought it for you. I want it now too! And Rainbow Rowell. I haven’t read any of her books, but they are absolutely everywhere on the end of year lists.